Tropical seagrasses in Kimberley, Western Australia. Enhalus acoroides (the large, dark green leaves) and Thalassia hemprichii are growing in mixed poplulations in the steaming hot water (up to 40 degrees C in the late afternoon). Take a tour in the stunning environment around Tannon Island in Western Australia. In each tidal cycle, the reef is submerged by 1-4 m of water that subsequently drains off the reef flat at low tide; this forms a waterfall which is 1.5 km long. Worldwide, coastal seagrass ecosystems are threatened by eutrophication and anthropogenic activities. I have recently been involved in research revealing severe root stress caused by elevated levels of toxic sulfide in the sediments, a side effect of decades with too many nutrients coming from nearby cities and extensive farming. Moreover, rising temperatures result in heat stress also of tropical seagrasses and we predict that we will still be loosing seagrasses in the years to come even if actions are taken now. Finally, the sea is currently absorbing huge quantities of CO2 from the atmosphere resulting in declining pH and rising CO2 in seawater. At present, the effect of acidification and rising CO2 on seagrass photosynthesis and growth is poorly understood. Exciting research on seagrass eco-physiology is not only limited to stunning tropical seagrass systems. 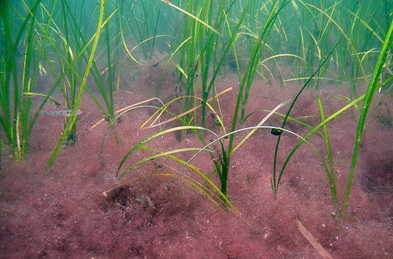 In fact, most coastal waters of Northern Europe host rich seagrass beds dominated by a single species, Zostera marina (Eelgrass). 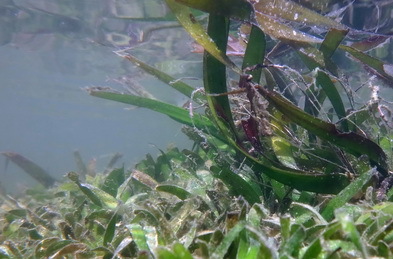 Unfortunately, eutrophication in particular has resulted in dramatic declines in seagrass cover and even if we have managed to restore the light climate, Eelgrass does not respond by covering the vast areas that it used to do prior to the extensive eutrophication than began back in the 1950s. Moreover, diseases caused by e.g., the fungus Labyrinthula resulting in Eelgrass wasting disease are possible still playing a role since the plants are challenged by muddy sediments exerting stress on the roots and rhizomes. Zostera marina from Øresund, Denmark. The lower part of the shoots are covered by a dense carpet of filamentous red algae. The layer of algae restricts water movements across the sediment surface and can result in severe oxygen deficiency in the basal part of the shoot.